12 pounds of fondant! This is Hannah’s 2nd birthday cake. Even though her birthday is in November we decided on a Halloween theme because she has no choice yet and it sounded fun to come up with a cool Halloween cake idea. 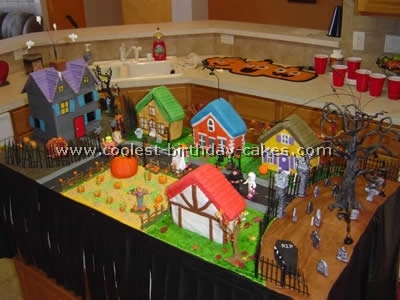 The cake portion is the four small houses and the pumpkin patch. Hannah’s piece of the cake is the large pumpkin in the patch. Everything else is cardboard, foam, tape, glue, paper clay, Polly Pockets, toys, Lemax lighting, wood, motors, string, wire, epoxy, metal you name it. We have about 16256 sketches of this Halloween cake idea! It took us a while to decide what to make. There are so many Halloween decorations out there. I made the mistake of looking online to see what people make for their Halloween decorations. Wow! So many great ideas out there. Took me a week of reading about other projects to finally give up and go back to our haunted house cake. It was a good thing we ended up making some outdoor decorations ourselves for the party which can also be used for years to come. The best part of the cake is the Flying Crank Pepper’s Ghost in the haunted house window. The worst part of the cake no one could see the awesome ghost in the window due to my bad design. Not many people were tall enough to lean over the cake to see in the window and those that were tall enough were too shy to do so. Duh. Ah next time. The ghost is a combo of a flying crank ghost and Pepper’s Ghost effect. If you want to ruin the fun of a Pepper’s ghost look it up. It’s the same effect the Haunted Mansion uses at Disneyland. So if you want to ruin your vacation to Disney look it up. (Disclaimer: I’m not forcing you to :). The most difficult part of the Flying Crank Ghost was finding a material that was light enough to bend on such a tiny ghost. I never did find one but I think the outcome was good enough. I tried shredded paper, Mache feathers and a few materials. I finally settled on one white material that was the most heavy but still flexible. It didn’t allow the elbows to bend like the paper or feathers but overall it looked better. We ended up adding fishing weights to the arms to pull them down when the string had slack. They couldn’t be seen in the end product. I also really like the jumping spider on the pumpkin. Very easy really. A 3 rpm motor with a spring piece of metal that rotates below. 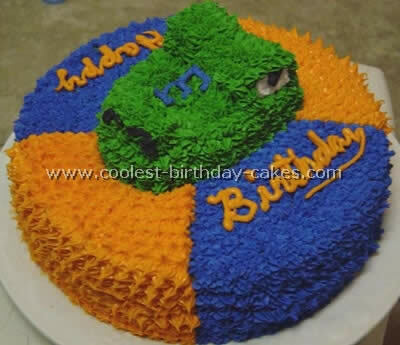 The spider has a wire (rod) going down through the cake that lines up with the springy metal. There is a bracket that blocks the springy metal as the motor rotates toward the rod. Once the motor goes so far the spring finally pops off of the bracket and pops the spider’s rod which shoots him up. So he jumps about every 20 seconds. I was able to recycle the Swiper mechanism I’d made for Syd’s Dora cake to use on the moving tombstone and skeletal arm coming out of the ground. Just a little adjustment and voila! Only bad thing is the day before we added the fondant to the floor, the runny sugar ran down into the shaft that was pushing the tombstone stopping it. If you ever need to cement anything use some raw glucose – holy cow. Took about a half hour to clean that all up and get it running again. Whew I thought it was a gonner at first. The coffin on this Halloween cake idea was really easy. 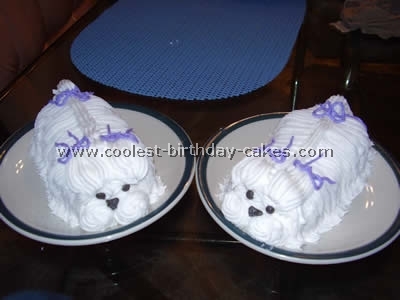 I used the same setup that ran Baby Jaguar from the Dora cake. Just had to shorten the shaft and add the skeleton arm. It took longer to make/size/cut/clue a pattern for the coffin. I refused to buy one even though you can easily find miniature coffins around. I had to add a quarter to the underside of the lid to keep it pull down to the hand. More fun to make than buy. The bats and ghosts are just hooked straight to shafts hooked to motors. Very easy. More difficult to run the shaft up the tree but we got it no problem. Lili molded the witch flying around the middle house. I thought it turned out really cute. Again I hooked a motor below the cake. The tree was originally going to be a Lemax spooky tree but it wasn’t nearly big enough for what we wanted so we molded our own. Just wish I’d thought of that ahead of time and added some glowing eyes. I didn’t have any tiny LEDs around the night we made that decision.Yep I need to stock up on more junk just in case. Franky and Dracula move from a piece of wood moving back and forth below the haunted house. The door opens via string attached and closes with the help of an elastic strap behind the hinge. This was one of the worst ideas on the cake. There were better ways to do this but I wanted to try an “easier” way which turned out much less effective (and locked up halfway through the party). I even had some nice rollers I could have used but didn’t even use those. Never again I say! The 4 houses were baked with Wilton’s house pan. It makes a decent base for a house. We wanted them to all look different and they do. The pumpkin patch is sunk so that we could add a chocolate cake here. We were hoping to hide a cake there so the entire ground looked the same. All of the ground for our Halloween cake idea is fondant. We also covered the haunted house with fondant to keep continuity with the other houses. The goal was to be a bit spookier but we really ran out of time the night before the party. BTW those “rocks” you see around the yard of the haunted house took two of us about 2 ½ hours to make. Never thought it would take that long. The bushes that hide the purple lights are made from a sponge and painted to look like fall bushes. The hills that the graveyard and haunted house set on are foam used for walls. I glued together sheets of ¾” foam then cut with the band saw and final formed with a knife and sandpaper. Lili made all of the gravestones from clay. I used the scrap from this to make the pillars for the gargoyles. The small trees and pumpkins were also made from clay. 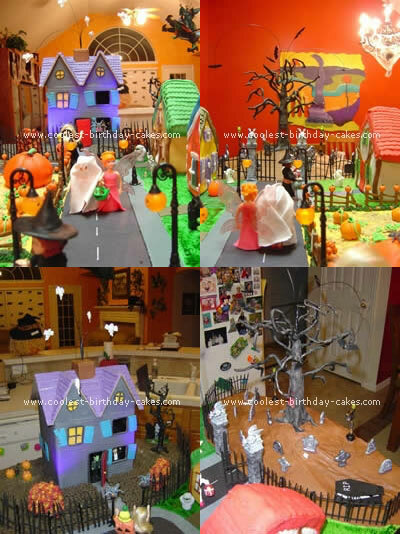 Most of stuff we made but we did cheat this time for our Halloween cake idea and bought some Lemax miniature stuff for lighting the streets around the town, the fence around the pumpkin patch and gargoyles (we made the pillars). The kids are actually Polly Pockets with their legs cut off to shorten them. Then Lili made costumes for each child for the Halloween celebration. The mummy Franky and Dracula we got at the dollar store as well. With so much other junk to do for this party it really made it easier to buy some of the accessories (we decorated the yard as well). We were able to use Halloween rings for the ghosts and bats. The skeleton in the coffin was ripped off of a Halloween straw.